I'd like to make an order, but I'm worried about submitting it online. How am I protected? How can I get a freight quote? How can I track my on-line order? I've placed an on-line order but need to change my information. How can I correct this? I've placed an on-line order but haven't received any freight information yet. What do I do if my order arrived, but seems to be missing parts? What do I do if I've ordered the wrong sizes, quantities, and/or models? Can you ship to Limited access, Residential, Inside, or Military areas? What exactly does it mean when a scale's capacity is stated as 5,000 lb x 1 lb? What size weighing deck/platform do I need to for weighing pallets? Do I need to calibrate my scale or is it factory calibrated? When does a scale need to be recalibrated? Is recalibration covered under warranty? Do FSD scales interface with a printer? Ordering online is FAST and EASY! On the main page of the item you want, click the yellow "Add to Cart” button. You can then continue shopping, view the contents of your cart, or check out at any time during you online visit. When you are ready to check out, click the “View Cart “ link in the right hand column or at the top of the page in the header text. Follow the onscreen prompts to complete your purchase. During the "Checkout" procedure, you'll be taken to our certified, 100% secure server. Most equipment is marked with free shipping. If the item you want to purchase is not marked with free shipping use the shipping calculator in the view cart page. Call us immediately at 800.238.0152. If the item has shipped to the incorrect address you will be responsible for the freight charges for address correction. Please be sure to make detailed notes on the receiving record that the freight arrived damaged and call us as soon as possible. The signed delivery receipt represents your acceptance of the complete order in good order. If you fail to specify that your order arrived damaged or missing pieces on the receiving record, there is very little we can do to help you file a freight claim. In addition, you will be responsible for any concealed (internal) damages if not reported to FSD within 24 hours of delivery. Please see above. If you do not mark that your order is missing pieces on the receiving record, there is very little we can do to help you file a freight claim. However, if the parts missing were concealed (nuts, bolts or clips in a box or bag) please call us immediately at 800.238.0152 and we'll ship out your missing parts immediately. It is vital that you check your e-mail to verify you will be receiving the materials you wanted. We send out several notices to you about the materials you ordered and if at any time you notice any discrepancies it is your responsibility to notify us ASAP. Failure to do so may result in restocking fees and return freight costs. If your order has not shipped and you realize that you have ordered the wrong size, quantity, or model please call or e-mail at 800.238.0152 as soon as possible. On all pre-pay and add shipments to non-business addresses or limited access locations, defined as private residences, apartments, dormitories, estates, farms, ranches, rectories, parsonages, military addresses, schools, construction sites, mine sites, prisons, or other locations where the entire premises on which a dwelling for living is located and/or is not open to the walk-in public during normal business hours and/or does not have a loading dock will result in an additional $70 delivery fee. Inside delivery and deliveries that require a lift gate truck will result in additional charges. This charge is non-negotiable and will be added even if you do not specify your address as limited access at the time you place the order. The National Type Evaluation Program (NTEP) is an evaluation program administered by the National Conference on Weights and Measures (NCWM). Type evaluation is the process whereby weighing and measuring devices are extensively examined to determine if the performance, operating characteristics, features and options of a particular device complies with the applicable requirements of the National Institute of Standards and Technology (NIST) Handbook 44. This means that the total weighing capacity of the scale is 5,000 pounds, and 1 pound is the smallest increment of weight that the scale will display. If you will be using the scale in commerce, most states require an NTEP approved scale. The four states that do not require NTEP COC are North Dakota, Texas, Vermont, and Rhode Island. We recommend a 4 ft. x 4 ft. deck. Our economical TS5-44-A scale is ideal for pallet weighing and general industrial use. NEMA 4X refers to an electrical enclosure rating based on requirements stated by the National Electrical Manufacturers Association (NEMA). Calibration is the process of adjusting the components of a scale so that it will accurately indicate zero, and accurately indicate weight in accordance with its capacity. All scales are factory calibrated before shipment to ensure accurate weighing. Most companies have a calibration policy to comply with their ISO or Quality System Procedures. FSD recommends a yearly calibration to ensure accurate weighing. No, recalibration is the user's responsibility. FAQs are intended as a convenience to provide general information to our customers, and FAQs contents are subject to change without notice. 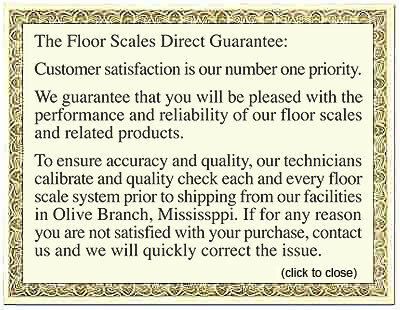 Floor Scales Direct assumes no responsibility or liability regarding FAQs content.